This web site has been quiet since Thursday night, but not because I wanted it to be. My daughter and I spent the weekend down at Disneyworld for "ESPN the Weekend" (as the invited guests of Disney Corporate Services, but more about that later this week). I had intended on posting stories from down there, but if you have ever stayed at a Disney property, you know that there are two inevitabilities: cell phone reception is horrid and what they try to pass off as "internet connectivity" is NFFWP (Not Fit For Work Purposes). Again, this will be discussed in a story later this week. 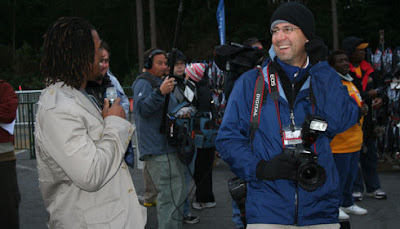 What was really cool was being out in the cold and drizzle in the wee hours of Saturday morning for the 2010 Champion 5K for the V Foundation, and being able to hang out side by side with the Miami Dolphins Cheerleaders, the Harlem Globetrotters, Trey Wingo, Dana Jacobson, John Anderson, and Carolina Panthers running back DeAngelo Williams. Here is a short picture essay from the early morning event that my daughter ran in. 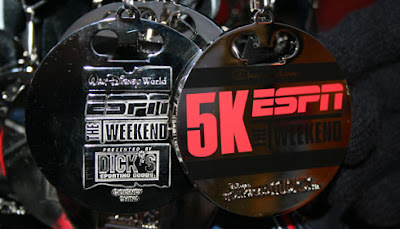 The V Foundation was run as part of the 2010 "ESPN the Weekend"
2010 "ESPN the Weekend" event schedule. 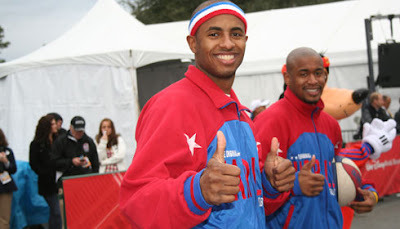 in the 2010 Champion 5K for The V Foundation. 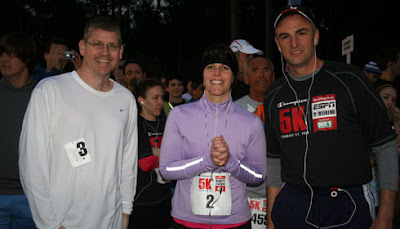 2010 Champion 5K for The V Foundation. runners in the Champion 5K for The V Foundation. work in the community. These three members of the squad did not run, but along with other team members, encouraged hundreds finishing the Champion 5K for The V Foundation. 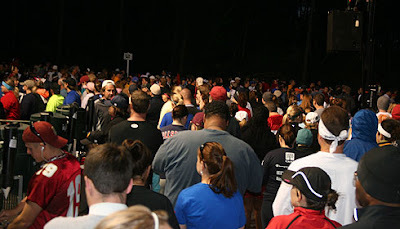 came out to encourage hundreds finishing the 2010 Champion 5K for The V Foundation. 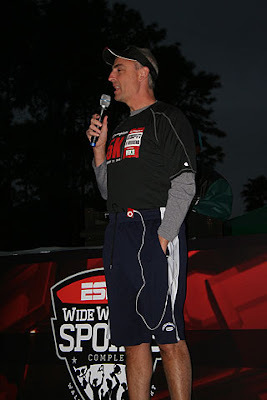 crossed the finish line at the 2010 Champion 5K for The V Foundation.